The Ontario Cannabis Store (OCS) is expecting to lose 25 million Canadian dollars ($18.7 million) in the first full year of the country’s new adult-use market, even though it had a monopoly on sales for the first six months of legalization and retains permanent control over all online transactions. That’s on top of the CA$6.8 million net loss the OCS reported for the period of Dec. 12, 2017, to March 31, 2018. Ontario expects the government-owned cannabis store to turn a small profit of CA$10 million in 2019-20. The budget projects profits to rise to CA$25 million in 2020-21 and CA$40 million the following year. “The OCS net income forecast reflects initial costs for the development of its wholesale distribution channel,” according to the budget. One year ago, the Ontario Cannabis Retail Corporation (OCRC) entered into a hefty CA$150 million loan agreement with the Ontario Financing Authority to fund a plan to establish 40 government owned- and-operated cannabis stores in the first year of legalization. The OCRC now operates as the OCS. The loan covers OCS expenses only through Dec. 31, 2019, so a significant top-up would have been needed for the government to grow its network of cannabis stores from 40 to 150 by 2020 – the previous government’s plan. The new government pulled the plug on that plan in favor of a privately owned network of adult-use marijuana stores. By March 31, 2018, the OCS had drawn CA$25 million from the loan. In response to questions from Marijuana Business Daily, the OCS said the loan agreement with the Ontario Financing Authority remains active despite the change in retail plans. Meanwhile, in 2018 the OCS entered into arrangements to lease premises for four of the first government-run stores on five-year terms. Those stores will never open. The “minimum lease payments” started at CA$207,000 in fiscal 2019, rising to CA$355,000 in fiscal 2023. Financial commitments to Ontario’s “cannabis warehouse” lease as of March 2018 were $364,177 (fiscal 2019), $569,051 (2020) and $588,730 (2021). The OCS maintains a monopoly over adult-use cannabis wholesale in the province, and the warehouse is used as a key hub for online orders. Ontario’s adult-use cannabis sales have been abysmal thus far – owing mostly to the fact that the first brick-and-mortar stores didn’t open until April 1, 5½ months after legalization. The OCS struggled to get a handle on its business in the weeks after legalization, resulting in lengthy shipping delays and thousands of customer complaints. Ontario was the only province in Canada to see lower month-over-month sales of adult-use cannabis from October to December – although sales did improve slightly to nearly CA$9 million in January. 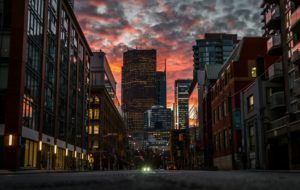 The hobbled rollout of retail stores in Ontario and British Columbia resulted in many publicly traded cannabis companies reporting disappointing quarterly earnings. The Bank of Montreal warned investors that adult-use cannabis revenues across Canada may come in lower than expected because of the slow build-out of retail stores, flat nationwide retail sales and inventory depletion. Nearly two dozen OCS employees agreed to unionize last month, making them the first union members in the province’s cannabis industry.